Before the existence of I-25, people traveling between Santa Fe and Las Vegas, New Mexico, used the Old Las Vegas Highway. Today, this former main road is dotted with wonderful communities and villages near Santa Fe. One excellent example is Seton Village. Named after its founder Ernest Thompson Seton—who also founded the Boy Scouts of America—this village is listed as a National Historic Landmark District. Available properties along Old Las Vegas Highway in Seton Village primarily include single-family homes, but condos are also available. These residences have a lot to offer homebuyers, and the variety of styles and sizes in Seton Village ensure that you will find something that fits your preferences and budget. When you are a resident of this area, you will become part of a community with a rich heritage. A central plaza in this village is an excellent spot to meet up with friends, and you may also enjoy seeing the ruins of Seton’s Castle, which was a 32-room castle that Seton built. This village also offers wonderful views of the Jemez Mountains and Mount Taylor, so you may feel inspired to spend time outdoors exploring everything nearby parks and natural areas have to offer. Hiking, biking, and picnic lunches can easily become part of your everyday life when you choose to live in this area. 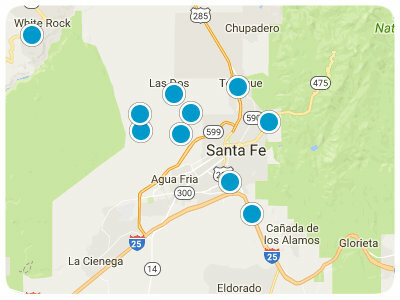 When you are ready for a more metropolitan adventure, you will only have to travel approximately seven miles to Santa Fe. This dynamic city is a wonderful place to appreciate the arts. Impressive artworks, captivating live performances at Santa Fe Opera, and interesting museums such as the Museum of International Folk Art are only a small sampling of what you will enjoy about life near this vibrant city. Fun local festivals and the Santa Fe Farmers Market are also part of this city’s attractions. No matter where you choose to spend your free time, you will be happy to think of your Seton Village single-family home or condo awaiting your return. Gorgeous natural beauty, welcoming neighbors, and interesting history are only a few examples of what you will enjoy about living in this village along Old Las Vegas Highway. Seton Village, New Mexico, real estate options are ready to impress you, and you are sure to find something that suits your style. If you are ready for more information regarding condos and single-family homes for sale in Seton Village, New Mexico, please do not hesitate to contact us. Property has access easement. Adjoining lots have homes. Electricity would be nearest pole.